No No, I Have No NO | GetAlongWithGod.comGetAlongWithGod | A blog about discovering a God worth knowing. I simply cannot get off the topic of our YES. Our yes to God is such a powerful force. In it we have the unique ability to unlock His Expression and Life towards us. He rejoices over our yes, and today I want to tell you more about it. I’ve never truly fathomed God’s heart in response to my own. Sure, I knew He responded to me, but I’ve never understood the powerful drive and passionate force. I’m seeing this reflected back to me in my relationship with two people for whom I carry His love. The sheer degree of intensity overwhelms me. It’s the relentless nature and joy that He expresses through me. To boil it down, He’s wild about His children’s receptivity and their YES to Him. God receives our unqualified yes towards Him with such great passion. I’m not talking about a limited “yes” with the right to bargain. What I am describing is a blank-check YES to God that few are willing to give. Yet I have witnessed it in these two people and God’s response in me is fierce! 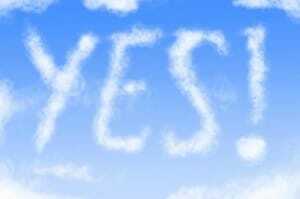 This yes is met with an equally powerful yes, so much so that it overwhelms and overtakes the giver. He meets our uncompromising yes to Him with the response of being unable to say no to us. Funny enough, I have only been able to experience this as His response in me towards another. Unfortunately, it’s been most difficult for me to see it as God’s response towards me. I think when we look through our own vision to see how God looks at us, we color the view with our own self-consciousness. Maybe to really see it, you must experience it for another and have another experience it for you? I haven’t met many people, if any, who properly receive the Father’s love for them. Most seem to judge, condemn, and shortchange themselves in fear. But I don’t think this is where the Father is at all. When He asks something of us, and we give our wide-open yes, He responds with exuberance. Can you imagine His exuberant response, the passionate zeal towards us? All I know is I’m witness to it as His life is lived through me. I can see how He responds to others. With each encounter, I always have the question, “Is this how You look at and respond to me?” I believe the answer is yes. He literally is expressing His heart through me in order to show His heart to me. And what I’m saying is that when we have no NO to Him, all He has is a YES towards us. God can’t wait to give us His YES. However, most of us think that He is more motivated by His no, then to express His yes. Oh, we’re so incorrect on that point! His pleasure is in Yes. He doesn’t dole out yeses ever so gingerly, while liberally passing out His no’s. Religion communicates no, no, no, but Christ’s life is an emphatic YES. The Word says it! It’s His Divine yes that He always gives. was not Yes and No; but in Him it is [always the divine] Yes. Why do we always see Him as such a NO God? It’s because we have a NO towards Him. His joy is to give His YES, and when we have no more no’s to Him, He erupts with passionate zeal to express, communicate and give His Yes to us. I’ve heard Him say to me about another, “I have no NO to them!” I’ve watched it, and seen it expressed before my very eyes. I’ve literally watched Him bestow His Yeses not only willingly, but also passionately and exuberantly. He just can’t wait to give His YES. I never want faith in Christ’s no! I want to remain in the vision of His Yes to meet mine. So today I cast off my god of no, and any no I have to God. Leaving that miserly, stingy, self-saving, resistant one, to give Him my unobstructed yes, meeting Him as the Divine YES. I always want to express, open-handedly, my Yes to Him, so that He in turn would have all yeses towards me. Can you imagine the power of a life that dwells within the vastness of YES? Can you conceive of someone who literally walks about in the Yes of the Father? What in the world would that look like?! JESUS – and Jesus in me! I thank God so much for being willing to express His Yes for another through my very life. I thank Him that I’ve been a witness to His living presence that says, “I have no NO to you!” Yes, I have the privilege and the joy to experience for someone else His absolute yes with no NO. May we all come into this reality to experience Him as the eternal YES! What an amazing perspective!- I like it!! I love this blog and the fellowship of believers who comment here. Thank you Martha, John, Jennifer, and Aaron for your willingness to share your journey with Jesus with the saints who follow these posts. It’s interesting to me that the verse speaks of the FATHER being glorified in the SON (instead of GOD being glorified in JESUS)!! Having “no NO” to say to God that you speak of here would come from the child’s heart to the Father, eh? It’s simply FA-TAS-TIC the way we are being weaved together as family through time and as witnesses (as you mentioned here)! How wonderful it is to get a glimpse of Jesus here!! But what will heaven be like, eh John?!! I just have one thing to say, “YES”! When He tells me His will & I respond with my “YES!” then He begins His work in me and through me. All the development in me takes me to completing His will. I also want to live in the YES of God to me. Not a theory or a doctrine or a word, but Jesus. I want that “Yes” to obliterate my beloved “no-life.” In fact, I know He is doing it. His yes is so Awesome! Wanting more of Him where there is a longing in your soul to please and honor Him!!! !